The biggest issue for me was the gun not being FULL AUTO. Maybe even having a need to reload every 30 shots could make it more interesting. It would desperately need some more visual and sound effects as feedback. I know you said you only like programming, I'm pretty much on the same boat, but there is so much you can do with even very simple assets when you throw math and programming into the mix. It was hard to get a feel of the direction and velocity because of the lack of texturing on the background and the walls. Quite an interesting "what if?" article to make a game out of! 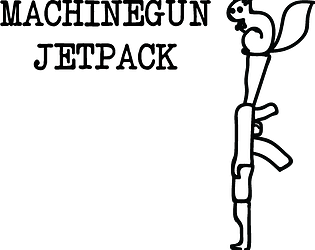 :) I like the idea (squirrel uses gun as a jet pack), but the execution leaves much to be desired. The physics are not very polished. It doesn't feel like I'm riding a gun by shooting bullets (wow that's a weird thing to say), it feels like I'm on a rocket whose thrusters are off by default, and left-clicking turns the thrusters on for one moment at a time. Those two things are quite different. I'm not sure if the game feels off to be because of the lack of animation & bullets or completely because of the physics--honestly I think it's a bit of both, and mostly the latter. A few commenters talked about the limited field of vision. I personally don't think that's the main problem, but it is definitely something to consider. For me the biggest problem is the level design--it does not fit the mechanics at all. This is a game about using a gun-rocket to go up to . . . somewhere . . . and your journey is hindered by these hard-to-navigate platforms that demand you to swerve left and right and every which way instead of rocketing upward. It's like the level design is fighting against the mechanics of the game. If the game had been better designed to fit the rocketing mechanics, then the level would be better, and the camera would be fine as-is. There are other problems as well, like the fact that I can go right through the floor I start at, and go through platforms before dying (it's extremely frustrating to skim a platform that you didn't see coming and just die), and that the checkpoint is on an odd area of the screen. But the level design is the biggest hindrance right now. It's the main reason I cannot go past the very first checkpoint, as much as I want to. I'm picking up from the comments that this is your first game development endeavor, and as a first game, it's ok. There is definite room for improvement. I wish you the best as you continue creating games. Fun and challenging. It would be nice if it had some more animation, like affects on the gun/squirrel. Perhaps a larger field of vision would be good too, that way you have a little more idea where the obstacles will be. These are my thoughts exactly, didn't feel the need to retype everything said here.